I just talked about how people are going to celebrate this date (08.08.08). Most people should be cheering either for the Olympics games, or registering for marriage. It turns out to be a memorable day for me, a sad one. My new pet, Hammie, was adopted few days ago. He (gender confirmed by the vet) was such a cute hamster. But he was getting sick, at first both eyes couldn’t open. “I’m feeding him glucose…” The doc continued, while shaking his head and sighing..
Cherry had hamsters before. Those were given to her as a gift. Although they were not really mine, I love to watch them move around, as if they were my own hamsters. 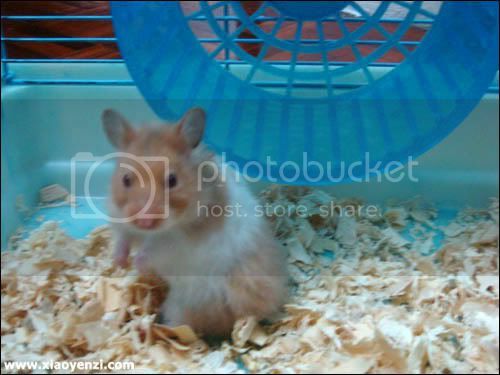 Now, I have my own hamster, staying with me in my room (not really hygene but that’s the only place I can locate it). Hamsters are so adorable…and no doubt, I love hamsters too!! There are 2 hamsters in my house. Both given by my sister’s friends. 1 named Little King (xiao wang or 小王) and the other named Black Fur (hei mao or 黑毛). Little King is the white hamster with light brown patches. It looks more cute than the black one. However it is very fierce that me and my sister dare not play with it. The black one, is tame and we can hold it in our palms and play around with it, thus taking pictures or videos of Black Fur is somehow much more easy. This is a video I just made, tribute to our hamsters. Enjoy yourself, although it’s a short one.